18.10.2018 You can’t be my wife and my best friend. Amy Farrah Fowler: Who's Tam? Sheldon Cooper: He was my best friend in the whole world growing up. Amy Farrah Fowler: Really? Why have I never heard you mention him before? Sheldon Cooper: Oh, of course I have. I'm sure I've mentioned him, like, five times this week. 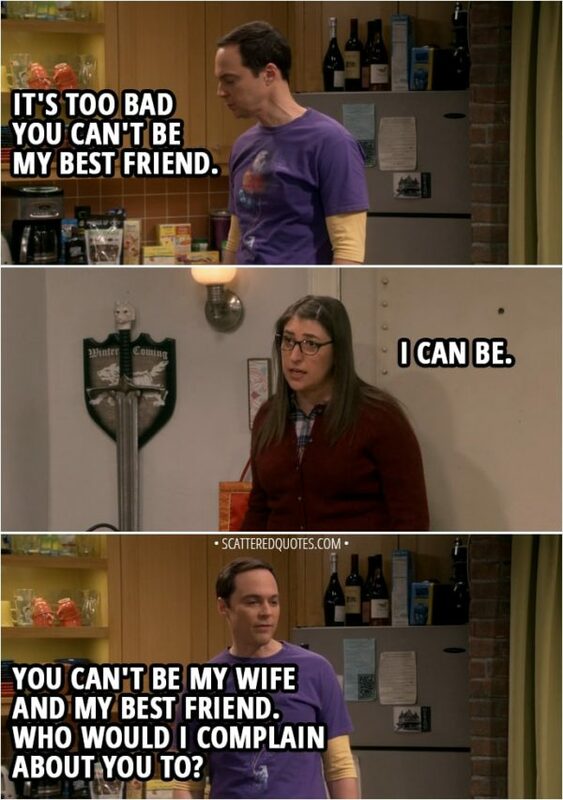 Amy Farrah Fowler: I don't think you have. Sheldon Cooper: Tam! Tam! Tam! Tam! Tam! There, it's only Thursday. Amy Farrah Fowler: I didn't just drink the crazy milk, I bought the crazy cow. John Sturgis: This list is getting long. Maybe we should write it down. Sheldon Cooper (narration): In that moment, I had an epiphany. I could draw up a contract for any social relationship. It was a helpful way to remove ambiguity in a world that was often hard to understand. I would go on to draw up such contracts throughout my life... With roommates, with my wife. Even with my own children. 23.9.2018 I would draw up such contracts… Even with my own children.